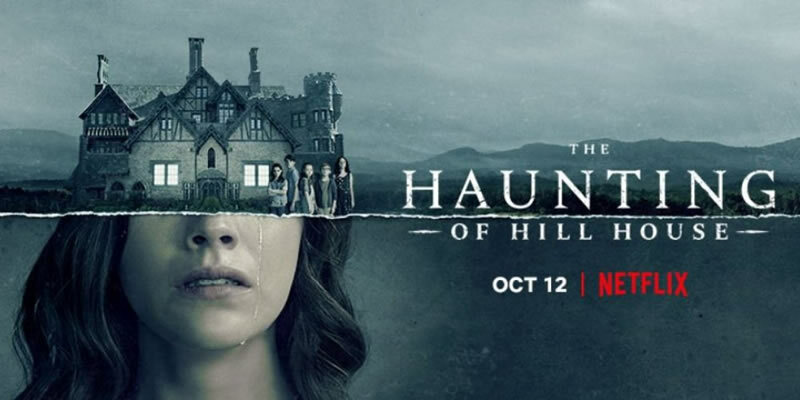 The Haunting of Hill House was yet another show that debuted on Netflix during October. Everyone has been raving about it! Even the King of Horror, Stephen King described the show as “close to a work of genius.” in his tweet! Anyways, whenever I watch two movies with suspiciously similar plots, over the years, they sorta’ merge into one (can’t tell them apart, in my mind). I just know that my younger brother and I watched it as kids (the parents were busy globe-trotting, our older sister was living in her dorm in Sharjah studying to get a business degree and our older brother was in high-school… in San Diego) and at the beginning of the movie, I was sitting up close to the tv while my younger brother was sitting farther away from the tv (the family living room tv is huge), but after the first few deaths, we slowly got closer and closer until we were practically huddling together in fear. My younger brother has since outgrown those fears, unlike myself. To be fair, I watched The Exorcist as a child (which scarred me, to the extent that I’m still afraid of the dark and my imagination goes wild whenever I hear any odd noises past midnight) and once my fears began to dissipate, as a young woman I watched The Exorcism of Emily Rose (2005) which completely refreshed them. To this day, I still get very uncomfortable at around 3:00am. After that, I flat out refused to watch any horror movie involving ghosts, hauntings and demonic possessions. A few years later, my cruel older brother tricked me into watching Paranormal Activity 2 (2010) which traumatized me (they had cctv cameras in the movie, we had cctv cameras set up in our home, they had an outdoor pool with the mesh skimmer thingy that the ghosts kept messing with, we had an outdoor pool and used the mesh skimmer thingy too). After that, I just couldn’t sleep alone at night anymore so… I got married (just kidding… sorta’). Unfortunately, people aren’t as vocal about this (no one has ever shared this with me before), but I experienced it first-hand, men snore (very, very loudly too)! I’d look over at my ex-husband’s face in the dark and imagine that he’d look possessed (and proceed to freak out, quietly). It was a waking nightmare! Then, I accidentally (I say accidentally, because it was my favorite cousin who chose the movie and booked the tickets online) watched Paranormal Activity 4 (2012) which involved an Xbox 360 (which as a gamer, I found so spooky)! I was an insomniac to begin with, but this took it to a whole new level! Unfortunately, when it came to my husband (now ex-husband) during both his presence and absence, I never truly felt safe or secure. It was for a bunch of other reasons too, but eventually I got a divorce and moved back in with my family (who as soon as I’d moved out, rebuilt the house from the ground up). Technically, we all live in the same house now, but it’s more like an apartment building (each of us with our own apartment, heck, each brother lives on a different floor) so we’re all sorta’ isolated from each other, as opposed to before, when I’d just walk out of my bedroom and run into a family member. As I said at the start of the post, everyone has been raving about The Haunting of Hill House, including Stephen King himself! I don’t wanna’ miss out on a great show (fomo starting to settle in), but at the same time, I really don’t wanna’ be dealing with the repercussions (being terrorized by every, single, imagined sound or movement, past midnight) for the next 3-6 months. Also, yes, this post was totally inspired by the fact that yesterday was Halloween. I actually meant to post it on the day of, but something came up and by the time I got back home, I wasn’t in the mood to blog anymore.